Your are Cordially Invited to the Education Fair arranged especially for TEFians. To commemorate the 20th year of TEF, TEF-2019 has organized a long awaited program“Education Fair” on 26th February 2019 (9.15 HRS – 17.30 HRS) at TAMARIND Hall, Block-I, Abu Halifa. Education Fair is organized with the participation of Mr. Nedunchezhian (Education Consultant) and a team of experts from TECHNOCRATS INDIA COLLEGE FINDER (TICF), Chennai. The detailed program is attached for your reference. Morning Session is programmed for all the Students & their Parents (TEF-2019 Members & Family) with an orientation program followed with a Questions-Answer Session. Afternoon Session is specially programmed for 8th, 9th, 10th, 11th & 12th Standard Students & their Parents (TEF-2019 Members & Family). The afternoon session is going to be a one to one consultation session (Consultants and Students with their parents). Venue: TAMARIND Hall, Block-I, Abu Halifa. 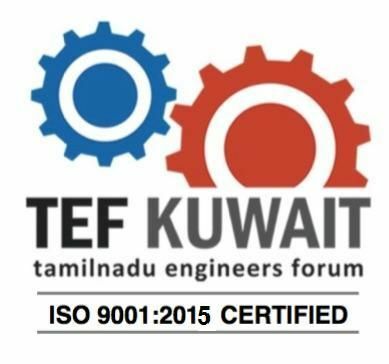 To organize the afternoon session in an effective manner, Parents of 8th, 9th, 10th, 11th & 12thStandard Students are kindly requested to fill the attached Registration form (EDUCATION FAIR REGISTRATION FORM) and send it back to anjal@tefkuwait.com to schedule your timing for the consultation. Registration is available up to 21.00 Hrs on 22nd Feb 2019 and requested to complete the registration to attend the Education Fair using the above "Click Here" Link. For further details, please contact Mr. Muthu Chidambaram (Mobile Number: 97244891).